My personal belief is that jewellery should be made to last a lifetime and beyond. Good design and workmanship stand the test of time and should not be greatly influenced by passing trends. I received my Bachelor of Fine Arts degree in Buffalo, NY and after arriving in Sydney I studied under a master jeweler for a number of years. I love every aspect of making jewelry … from working out the technicalities of a design on paper to seeing that design through to a completed piece. Every stage of the process is still exciting to me. When it stops being exciting I’ll probably stop making jewelry. Colour, texture and three-dimensional fluidity of form are what drew me to work with precious metals, gemstones and cloisonné. Natural imagery such as landscapes, light, movement, organic shapes and simplicity of form continually inspire my work. I enjoy designing and creating my jewellery around a specific theme or stone. Often the stone dictates the direction the piece will take. I like using gold and silver together, which adds depth, dimension and beautiful colour variations. 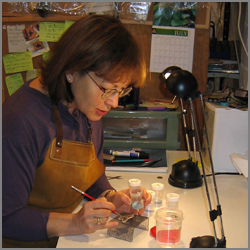 Cloisonné enameling is just the icing on the cake for a craft that I love. I treat my enamels as I would a painting. As well as being well-crafted beautiful objects, I want them to tell a story.